As I began this post, I was on a train speeding to San Diego for the annual convention of all things geek. After a strange noxious odor entered the business class cabin, the Hollywood types around me started chatting about various industries things. Turns out they all worked on an upcoming film together, Into the Storm, and I have a nice chat with one of the actors. Turns out it’s his first time to Comic-Con and he was excited. This the strange confluence of professional, press and fans draws me back to the convention year after year. I pay my way by working for CBR covering panels, interviewing talent and suffering The Walking Dead. Oh, yeah, I’m not a fan of that show, but I swallow my pride and dutifully listen to Andrew Lincoln talk about a show that is much better when he’s talking about it than the one I’ve tried watching on my television screen. That’s the Comic-Con bargain I strike for odder, stranger experiences like this train ride. And that brings me to the point: this year, I’m spending three days in SDCC’s mythical Hall H.
My encampment for the next few days. 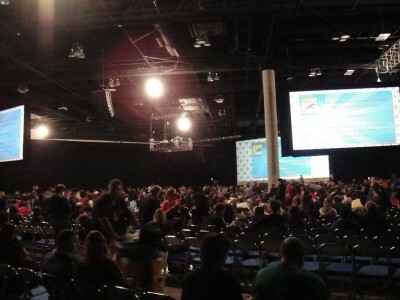 Since the year it opened, Hall H has been the toughest room to enter because all the marquee presentations occur there. Game of Thrones, The Big Bang Theory and Doctor Who all have capacity events there and the line snakes around the ocean facing side of the convention center complex, down the back of the center to the spot where they keep the forklifts. And I’m spending the majority of my time in that line or inside the Hall itself, covering such things as The Walking Dead and Game of Thrones. I know from the fan side, this sounds like a dream job, but any job stops being a dream once it’s a job. So, to stave off that malaise, I’m doing some extra creative stuff while in Hall H. Interviewing people for a This American Life style radio report thing that will probably end up in the Show podcast feed. And speaking of feeds, feel free to follow me on Twitter and the Satellite Show Instagram account as I try my best to give all of you at home a press-eye view of this utter circus. Oh, and make no mistake. Comic-Con is a circus. It’s trying, loud and crass, but it sometimes allows you special moments that make all the trials worthwhile. Despite the occasional gripe, it’s quite privilege to be at this thing and I don’t know if I’d ever give it up. This entry was posted in Nerd Alert, Newsmash, Projected Pixels and Emulsion, Satellite Show Sports, Transmissions, Travel and tagged circus, Comic-Con, hall h, sdcc, sdcc2014. Bookmark the permalink.